Graffiti artist Banksy has marked the end of the Copenhagen climate conference with a series of murals, including one on global warming. The four works appeared along the Regent's Canal in Camden, north London. 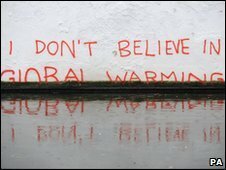 One includes the phrase: "I don't believe in global warming," with letters disappearing below the water. Banksy has gained an international following for his graffiti and exhibitions, the latest of which drew 300,000 visitors in Bristol. 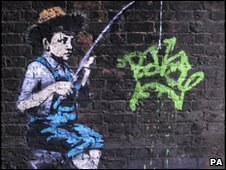 His four new works near Camden's Oval Bridge also include a mural of a boy using a fishing rod to pull the name Banksy out of the river. Another mural shows a rat wearing a top hat and suit, while the fourth depicts a man pasting up wallpaper that resembles graffiti. In September, Hackney Council in east London partially covered a Banksy mural with black paint by mistake. His spoof image of the Royal Family appeared on the side of a building in Stoke Newington, east London, before it was painted over. The UN Copenhagen summit ended at the weekend without setting legally binding climate change targets.